We have decided to try to eat vegan once a week (more if possible) so last night for dinner I made a mess of stuffed mushrooms for dinner. 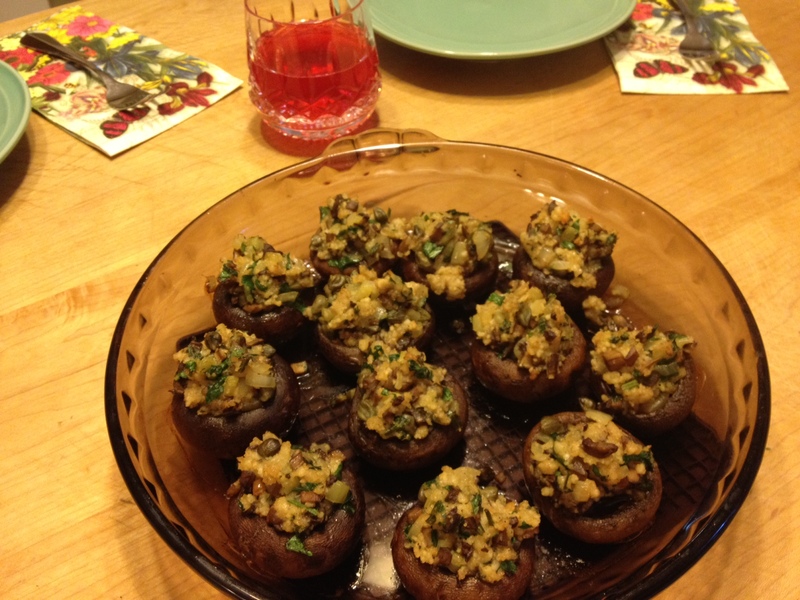 Stuffed mushrooms typically have breadcrumbs in them and there are a lot of ways to handle this if you are gluten free. I’ve taken corn-flakes and thrown them into a food processor. This works amazingly well. Sometimes I try a product off the shelf and up until this latest product I haven’t been all that impressed. Ian’s brand Gluten Free Panko Breadcrumbs are wonderful. Here is the best thing I can say about any gluten free product. You won’t notice a difference from the gluten filled equivalent. This gluten free thing gets easier and easier as it becomes more mainstream. Things have changed dramatically on the grocery shelves and in restaurant-land in the four years I’ve been learning about all of this. It reminds me of when major coffee chains began carrying dairy alternatives nationwide (2000? 2001?). So this is one more welcome change. Here is roughly how I made these. I say roughly because I really didn’t measure anything so I am guess-timating here. 1 celery stalk finely diced. In a large non-stick skillet add the remaining two tablespoons of olive oil and heat the pan well. When the pan/oil is good and hot toss in the finely chopped mushroom stems and let them sit – stirring very sparingly – until they start to brown. Then add the finely diced celery, onion, and parsley stems and sautee until the onion is softened and starting to appear translucent. Add the capers, the thyme, and breadcrumbs and sautee constantly. This will go very fast and the mixture will quickly look very dry. This is when you will begin adding the broth. You want to add enough broth that the breadcrumbs are moist, but not mushy/soggy so go easy on the broth and add it slowly (you may end up adding less than a 1/4 or maybe slightly more). Once the desired consistency is met turn off the heat stir in the parsley leaves and add pepper to taste. I don’t add salt to this recipe because we are not huge fans of salt in our food and I feel that the capers are just enough salt for this dish. But taste the stuffing at this point and adjust things to your taste. After the fifteen minutes are up for the first roasting of the mushroom caps take them out of the oven and set them down on a heat-proof surface. With a spoon fill each cap with the stuffing mixture until it is evenly distributed. I had a little more than I needed but I ended up just eating those two spoonfuls (yum). Place the pan back in the oven and roast for 10 more minutes. Serve them piping hot from the oven immediately. These are so good and they don’t contain things that you often find in stuffed mushrooms – thinks like cheese, garlic, or bacon. You really won’t miss them. The fresh thyme (from my garden!) really adds this wonderful flavor, and the texture of the celery and onion along with the saltiness of the capers and the freshness of the parsley (also from my garden!) makes this a nice late-spring dish. In Oregon we are still having cool nights so turning the oven on is not something we need to avoid yet.